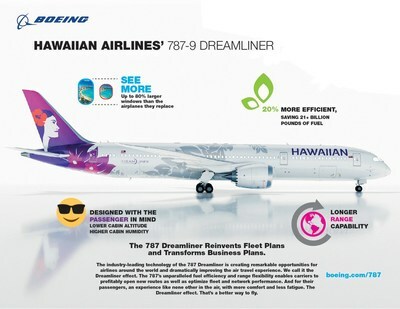 SEATTLE, March 6, 2018 /PRNewswire/ -- Boeing [NYSE:BA] and Hawaiian Airlines announced today that the carrier has selected the market-leading 787 Dreamliner as its flagship airplane for medium to long-haul flights. As part of the selection, Hawaiian intends to purchase 10 787-9 jets valued at USD 2.82 billion at list prices. Hawaiian also has purchase rights for 10 additional 787s.